"They gave me a choice: die, or become a Sparrow." 20th Century Fox has just revealed the second official trailer for spy thriller Red Sparrow, starring Jennifer Lawrence as the mysterious, deadly double agent spy named Dominika Egorova. This trailer comes after a TV spot aired during the Golden Globes last night. Lawrence plays a woman named Dominika, who is forced into a Russian spy/double agent program. In addition to Lawrence, the cast includes Joel Edgerton, Matthias Schoenaerts, Charlotte Rampling, Mary-Louise Parker and Jeremy Irons. This is the latest film from director Francis Lawrence, who last directed the final three Hunger Games films. All this new footage looks slick, I'm excited for it. I'm curious about the double agent storyline and how it works, but I'm already sold and looking forward to finding out. You can still watch the first teaser trailer for Red Sparrow here, to get another glimpse at this movie. When she suffers a career-ending injury, Dominika and her mother are facing a bleak and uncertain future. That is why she finds herself manipulated into becoming the newest recruit for Sparrow School, a secret intelligence service that trains exceptional young people like her to use their bodies and minds as weapons. After enduring the perverse and sadistic training process, she emerges as the most dangerous Sparrow the program has ever produced. Dominika must now reconcile the person she was with the power she now commands, with her own life and everyone she cares about at risk, including an American CIA agent who tries to convince her he is the only person she can trust. 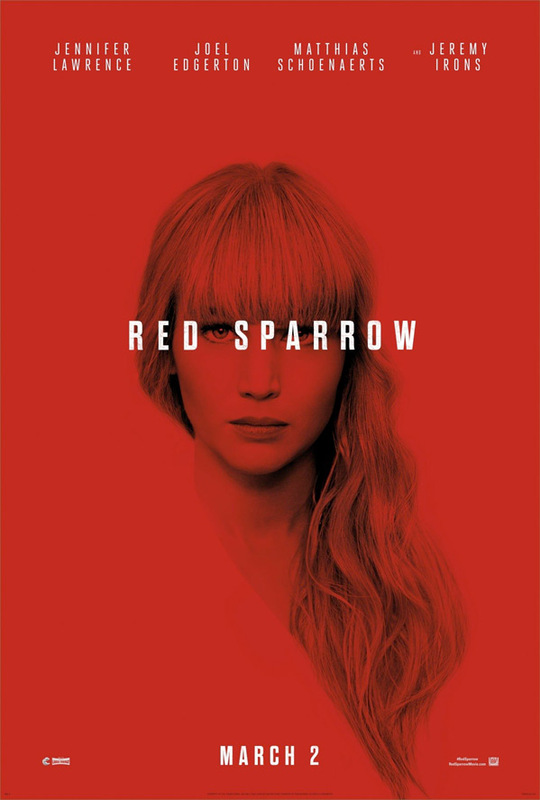 Red Sparrow is directed by filmmaker Francis Lawrence, of the films Constantine, I Am Legend, Water for Elephants, The Hunger Games: Catching Fire, and Mockingjay: Part 1 & 2 previously. The screenplay is written by Eric Warren Singer and Justin Haythe, based on Jason Matthews' novel of the same name. 20th Century Fox will release Lawrence's Red Sparrow in theaters everywhere starting on March 2nd, 2018 this winter. Your thoughts?